Why do you need blue light blocking glasses? For starters, the average adult spends 11 hours each day looking at screens. That's a lot of YouTube clips, games, Facebook feeds, spreadsheets, television shows, and cat pictures. Have you ever stopped to wonder what all these screens are doing to your health? Artificial blue light given off by mobile phones, TVs, computer monitors, and even LED light bulbs can be harmful to your eyes and your sleep quality. Your eyes get dry. Computer headaches become more common. Excess blue light from screens keeps you awake when your body should be getting the rest it needs. That rest is essential for preventing chronic illnesses and every day ailments. What can you do to ensure that you're protecting your eyes and getting the best sleep? Do what thousands are already doing ? from celebrities, to computer experts, to doctors, to your coworkers. Protect your eyes and improve your sleep with a pair of blue light blocking glasses. How Does the Blue Light Spectrum Affect Your Health? What Types of Blue Light Blocking Glasses Are There? What Differences Exist Between Blue Light Blocking Lenses? Three members of our staff have spent over 40 hours testing a dozen blue light blocking glasses. Choose from our favorite 6 pairs, including clip-on and wraparound models. Stylish glasses /w clear lens that turn dark grey outside. All-purpose blue light blocking glasses, great price. Tackle insomnia, jet lag, and improve your sleep quality. New release from the premier gaming glasses brand. Protection for those already with prescription glasses. Dark amber lens to help you sleep better. As seen on dozens of news outlets. Eye Love is a manufacturer of many different types of eyeglasses and sunglasses, all of which feature polarized lenses. These Blue Light Blocking glasses do not look much different than a standard pair of fashion eyewear at first glance - a big plus if looking good is high on your list of wants! They do, however, boast one major difference - their transitional lenses! Protecting your eyes both indoors and out is a breeze thanks to eye love. Not only are you blocking out the harmful blue light emitted from electronic devices, but when the lenses fade from clear to a darker grey, you are also eliminating glare and harmful UVA/UVB rays! Eye Love is known for their quality and compassion. A portion of all of the companies profits go towards helping provide eye care to those in need, so while you are helping your own eyes, you can feel good knowing you are helping others at the same time! Cyxus, a company who specializes in producing glasses that filter out blue light, has created a pair of casual and practical glasses that look just like any other pair of eyeglasses. You would never be able to tell that they are a blue light filtering product, and that is one of our favorite things about this model! While many blue light filtering glasses have a bright orange lens, Cyxus glasses are completely clear, framed by a simple and practical black. Wear them in public without calling attention to the fact that they are anything out of the ordinary. Some blue light filtering glasses are only really suitable for indoor use, making them quite impractical in everyday situations. Blue light literally surrounds us - it is what makes the sky look blue! And while natural blue light is not harmful, it does damage our eyes over time. There is no physical way to escape blue light in your modern day-to-day life, thus the need to protect your precious eyesight! If you are looking for style more in line with gaming glasses, then look no further than True Dark Twilight. These stylish gamer glasses features an orange tinted lens that is designed to not only block out blue light, but also reduce eye strain and eye fatigue. The True Dark Twilight are also the first and only gaming glasses that are designed with multi-layer optical filters that can block all performance robbing wavelengths. A bonus feature for this model, extra padding around the eyes, is designed for comfort and to prevent any extra harmful light from sneaking in. Along with blocking blue light from your device, the True Dark Twilight glasses will also allow you to sleep better at night. These black wraparound frames are stylish and provide a snug fit and full protection. True Dark Twilight blue light blocking glasses are the obvious choice for serious gamers looking to sleep better, faster, longer. Gunner has been around since 2007 and is the most prominent gaming glasses brand. They have fantastic designs and multiple lens types. The Optiks Intercept have a lightweight, durable frame with lens that has been approved by the FDA. They're hella stylish, with amber lenses that will allow you to game comfortably for long periods of time. These blue blocking lenses also protect your circadian rhythm, thus ensuring a better night?s sleep after long gaming sessions. The amber lens will block 65% of harmful blue light from 380nm to 450nm, which is the 2nd highest level of protection offered. Gunnar has other lens tint options, including Liquet, Crystalline, and Outdoor lens. If you already wear a pair of reading glasses, consider the GameKing Ultra Clip-Ons. Why spend money on a second pair of glasses when this simple pair fits right on top of the ones you already rely on daily. The GameKing model is designed to attach to an already existing pair of glasses. In addition to blue blocking technology, the lenses also feature an anti-glare coating which reduces eye strain and enhances depth perception. This budget friendly alternative to a full pair of blue blocking glasses boasts the same type of technology as its competitors without the unnecessary. frame. These lens will block 60% of overall blue light and 85% of blue light in the harmful 400~440nm wavelength. If you already wear reading or prescription glasses, then the Swanwick Sleep Fitovers are a wonderful way to protect your eyes without interfering with your primary lenses. 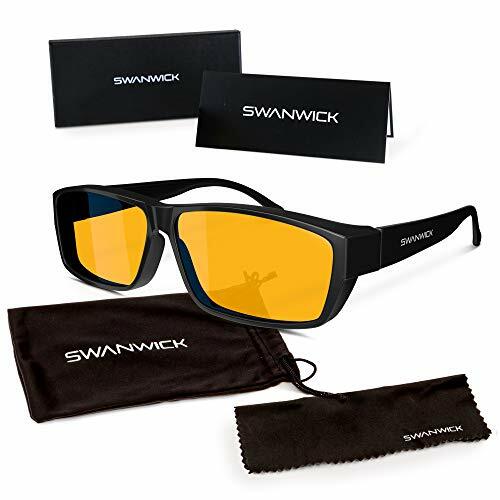 The lenses on Swanwick Sleep Fitovers feature an orange tint, which blocks the majority of harmful blue rays emitted from your devices. In addition their blue blocking technology, this model also features anti-reflective and anti-glare technology, meaning they can help you prevent insomnia and macular degeneration. The wide comfortable fit of Swanwick Sleep Fitovers will ensure that you can wear them for hours in conjunction with your regular glasses without any distortion of vision or interference. Their neutral and sleek style will not look awkward or bulky, they easily slide over top like they were meant to be there. If you are having problems sleeping at night, the multiple protective features of the Swanwick Sleep Fitovers combined with their versatility and ease of wear will make them a choice you are not likely to regret. There are many sources of artificial blue light and if you don't take the necessary precautions in protecting yourself, you are bound to deal with an array of problems like eye strain or insomnia. Blue light blocking glasses are a common solution. If you decide to get yourself some blue light blocking glasses, you will have to choose from various types and brands. It is always a good idea for you to be able to identify the best glasses that will be of good value to your money. Let us explore some of the things you ought to know about blue light blockers. If you find yourself trying to answer the question "why am I not sleeping well," then you need to read on. These issues are more severe in older individuals and children. They also affect the way your brain functions, and this could affect your output at work and class. When using blue light blocking glasses, you should put them on about 1 to 2 hours prior to bedtime. This way, your brain will have adequate time to stimulate the pineal gland for the production of melatonin, which is the sleep inducing hormone. For people looking to reset their circadian rhythm for long-term basis, you should consider getting two pairs of glasses: one for use during the day and the other one for evening/night use. To pick the most reliable glasses, you will need to review the different types of blue light blocking glasses and lenses available to identify the ones that are the best for a specific time. If you have not been using these glasses, you should get yourself and everyone in your family a pair. This is because they will help you get quality sleep for healthy living. So, when do you wear blue light blocking glasses? We can't do without electricity, especially when it comes to lighting up our surrounding. Electricity has also allowed us to utilize various electronic devices like cell phones and computers. Did you know that all these items emit blue light that has various side effects to your sleeping cycle? With so many hours behind a computer, I sometimes find myself wondering, "why is my sleep so restless?" Many people find themselves in the same situation, bringing up the question, can you change your circadian rhythm? The answer is, yes. You can do this by buying blue light blocking glasses or clip-on that will reduce its intensity and the amount of blue light passing through your retina. In fact, most of the people who use the glasses refer to them as sleep glasses because of their ability to improve sleep. These glasses are designed with lens that can prevent partial entry of blue light spectrum into our eyes. This prevents the disruption of melatonin production by the pineal gland. Learning why and when melatonin is secreted and how blue light blocking glasses help will guide you in figuring out how to reset your circadian rhythm. This is because the hormone tells your body when to sleep and wake up. If you sleep better, you will be in a better position to manage depression and stress. When you stare into the TV, laptop, tablet, or cellphone screen for too long, your eyes are bound to strain. This is bad for your short-term and long-term health. Using blue light blocking glasses protects your eyes against such side effects. Some research institutions have concluded that the prolonged exposure to blue light could result into various cancer types. Nurses, factory employees, and other shift personnel are notably affected. This is a problem associated with optical health and it develops as we age. Although most scientists associate macular damage with ultraviolet rays, others argue that blue light could cause more damage. Like most other products in the market, you will find various types of blue light blocking glasses. It is essential to know which glasses are ideal for you as you try to learn how to get into a deeper sleep. The types of blue light blocking glasses vary based on factors such as the time worn and where to use them. For instance, there are the glasses that are ideal for indoor use during the day. These are supposed to keep your eyes protected from the blue light emitted by the computer, phone, and other electronics. There are computer glasses that are used to specifically block light for computers in the office or at home. You may not want to use these glasses outdoors since they may be darker and therefore affect your visibility. If you use prescription glasses, then you need to search for clip-on or fitover blue light blockers. They come in varying sizes that you can choose from based on your existing glasses. What is interesting about the clip-on glasses is that you can flip them over while using a blue light source or flip them outwards when you are walking or doing activities that require a clear sight. 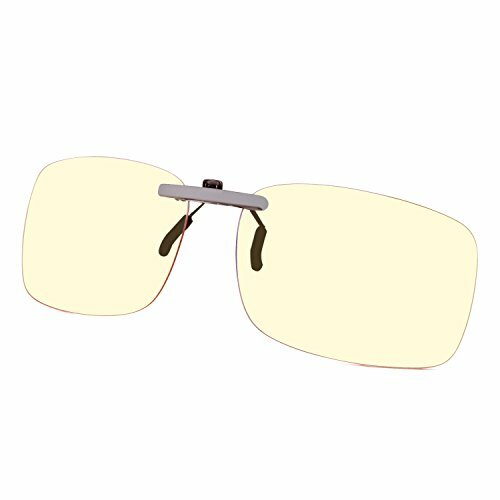 There are glasses with light yellow lens that are used indoors during the day. They are efficient at blocking blue light, which could affect your natural sleep cycle. If you are walking outside, you can remove the glasses so you can enjoy the natural sunlight. The amber lens is specially designed for use in the darkness since you will be using artificial lighting and electronics that emit high levels of blue light. You will also get clear lens glasses that are designed to block up to 50 percent of the blue light. Since the other 50 percent goes through your eyes, you will not have to put up with color distortion. Some users argue that colored lens affect their sight. For such individuals, clear lens glasses are ideal. You need to get the right type of blue light blocking glasses if you are looking for how to get a deeper sleep. Different lenses can block a certain percentage of the blue light spectrum. The glasses that block the most light between the 440 nm and 470 nm wavelength are the best. Although scientists do not agree on the actual amount of melatonin needed for quality sleep, finding glasses that can block most of this light will prove to be the best. When buying blue light blocking glasses, you need to consider your style and establish what you really need. There are nerdy designs and more classy types. Most users argue that going for classy glasses is best since you can go with them to social events or places like the club. Sometimes, people wear the glasses just to relax at home while others escape the couch and take a walk with a plan to sleep later on. As mentioned above, there are various types of lenses used on blue light blocking glasses. You will find brown, clear, yellow, orange, and amber lenses. Although each of these colors is good at reducing the transmission of light, the amount of spectrum they block varies. The orange lenses block most of the light in the blue wavelength range. This way, the quality of your sleep will be improved. Your sleep-wake behavior will be much better. You should go for the glasses that have an anti-reflective or anti-glare coating. This will reduce the reflection of light through the glasses that could cause your eyes to strain and affect your vision. This will reflect on the durability and quality of the glasses. As such, you should look out for glasses that are made from premium material like acetate. Acetate is made from cotton fiber and is often described as natural plastic. This is going to be an important attribute to the conservationists since it is renewable as well as friendly to the environment. Consider the brand of glasses you wish to acquire. This will determine the amount of protection the lens will provide to your eyes. The brand selected could also influence the quality of the glasses. Avoid buying cheap glasses and look out for their authenticity. If you wear eyeglasses and you want to know how to increase deep sleep time, you should go for blue light blocking clip-on or fitover. Their compatibility will be determined by the size and shape of lenses featured. We all know that sleep is essential for normal growth and development. If using blue light blocking glasses will help improve your sleeping quality, why not get yourself a pair? In our opinion, Cyxus makes the best all-around choice, especially for first time buyers of blue light blocking glasses. Their glasses include clear lens and are priced to sell. For those looking to improve their sleep, look into both the TrueDark Twilight and TrueDark Daywalker pair. Combined with better sleep hygiene you'll be sleeping better within a few weeks.